The Phillies continued to check off their Christmas needs list this December. Fresh off the trade for OF Ben Revere the Phillies have acquired Michael Young from the Texas Rangers for right-handed reliever Josh Lindblom and a Minor League pitcher, Lisalverto Bonilla. Young, 36, waived his no trade clause to become a Phillie. Staying in Texas would have meant less playing time as either a utility player or DH. In Philadelphia he'll be our everyday starting third basemen. 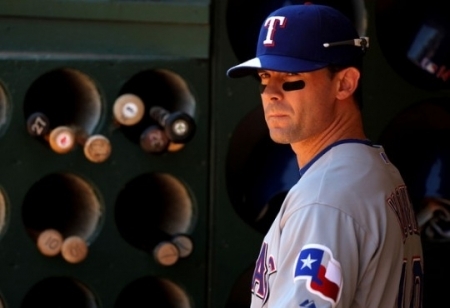 Young leaves Texas after 12 years and as the all-time leader in games, at-bats, runs, hits, doubles and triples. 2012 was considered an off year only batting .277 with eight homers, 67 RBIs and a .682 OPS. He is a career .301 hitter, 7-time All-Star, and AL Gold Glove winner at short stop. Young is a great fit for Philadelphia. He's a clubhouse leader and veteran with playoff experience. He loves winning, playing hard, competing with passion. He chose to come to Philly to be a part of this team and play in front of our fans.